AMANDA SABGA/Staff photoLondonderry's Ethan May (3) is fouled by Exeter's Kevin Henry (22) during the Division 1 semifinals. AMANDA SABGA/Staff photoLondonderry's Maxwell Des Rosiers (55) jumps for the ball facing off again Exeter's Ethan Imbimbo (34) during the Division 1 semifinals. He finished with a team-high 18 points, but it wasn't enough as the Lancers fell, 62-51. DURHAM — For a while, it looked like Londonderry was down for the count, trailing by as much as 15 in the third quarter against an Exeter team that hadn’t lost all season. But Lancers coach Nate Stanton knows that’s not how his team is going to go out. “They’re such a tough group,” said Stanton. “I just told them they’re the toughest team I’ve had here in six years, and that says a lot because we’ve had a lot of tough kids come through. 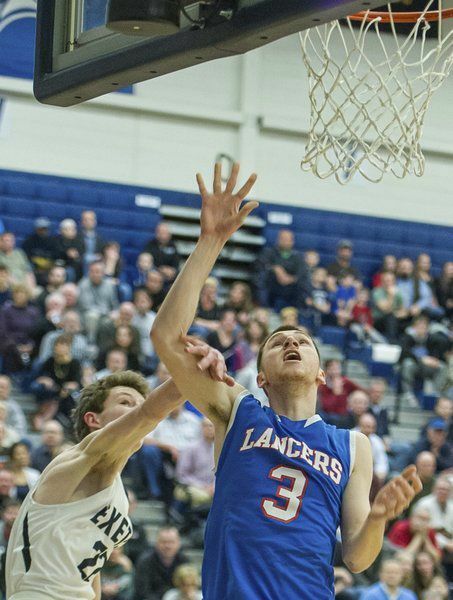 Led by Max Des Rosiers, Londonderry made a valiant charge in last Wednesday’s Division 1 semifinal and even took the lead late in the third when the senior pulled up for a mid-range jumper. But top-seeded Exeter remained composed through the run, using a 25-point performance from sophomore Josh Morissette to eventually down the Lancers, 62-51, to advance to the state title game. Fourth-seeded Londonderry (17-5) took the lead with 5:57 left in the fourth when sophomore Jackson Cox finished an acrobatic layup through traffic. But Morissette and the Blue Hawks (20-0) wouldn’t be denied, overcoming the scrappy Lancers with an 18-7 run to end the game. Exeter led 31-21 at halftime, but were able to stretch the led farther thanks to the play of Morissette and senior Kevin Henry (19 points). Des Rosiers, who finished with a team-high 18 points on 7-of-10 shooting from the field (4-of-5 on 3-pointers), helped to will the Lancers back into the game. Fellow senior Ethan May (5 points) hit a big three during the run. Londonderry led early in the first quarter and trailed by just three (15-12) after one. But a 13-0 Exeter run in the second quarter helped the Blue Hawks build a nice cushion heading into the break. The Lancers may have fallen one game short of the title, but have the youth to be back next winter. 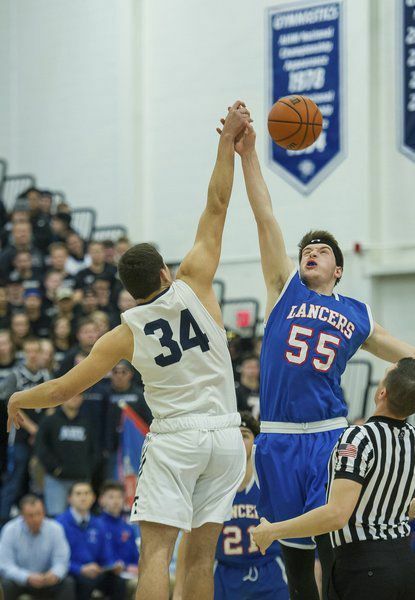 Seniors Des Rosiers, May, and sixth-man James Buttafuoco will be tough loses, but the Lancers have the young talent — especially in Cox — to be contenders again. An athletic, 5-foot-10 guard who can jump through the roof, Cox finished with 13 points in the loss. Junior Cole Keegan and sophomore Will Reyes also got the start in Wednesday’s semifinal for Londonderry, and junior Luke Marsh and sophomore Dean Haggett saw valuable minutes off the bench. “Jackson is our most improved player from Day 1,” said Stanton. “He played JV as a freshman last year and now he’s stepping into the varsity starting role as a point guard. He’s very athletic, the quickest guy on the floor and he just finds a way to get to the rim. DURHAM — Exeter won its first Division 1 crown in convincing fashion, downing Salem 53-30 in Saturday’s state final. Senior Kevin Henry picked up the slack for the undefeated Blue Hawks (21-0), scoring a game-high 18 points, and Ryan Grijalva and Josh Morissette both chipped in with 11. Salem suffered from early foul trouble, as high-scoring senior Kyle Poulin picked up two fouls in the first 35 seconds of the game and sat out the rest of the first quarter, and guards Trevor DeMinico and Zack Caraballo eventually fouled out. Just as problematic, Salem made an uncharacteristic 19 turnovers, including 14 in the second half, and was ice cold from the floor, hitting just 11 of 48 field goal attempts.